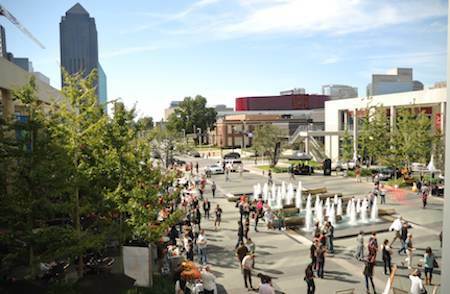 As part of the Dallas Arts Districtâ€™s Art in October Celebration, One Arts Plaza will host its second annual Fall Block Party on Sunday, October 30, 2011 from 12 pm to 4 pm. You and your family will enjoy a variety of live entertainment featuring Hunter Sullivan and his jazz band and specialty food and drink demonstrations from foodie favorites Tei-An, The Commissary, Screen Door, Fedora and Jorgeâ€™s. Bring the kids, because there will be plenty of Â family friendly activities like face painting. Downtown dwellers and nearby residents can also stroll through the farmerâ€™s market vendors, located throughout the plazaÂ Â and Â taste a variety of food and drink samples from local favorites including Ben E. Keith beer, John McClung Hasty Bake Grills demonstrations, Virtuoso wine, Round Rock honey and Jorgeâ€™s cigar bar. Additionally SPCA of Texas will be on-site and dog owners can bring their canine friends out for the dog Halloween costume contest! The One Arts Plaza restaurant bar managers will kick off the afternoon with a creative Halloween Spirits competition at 1 p.m. and Hunter Sullivan will hit the stage at 2 p.m. The event is free and open to the public. Located at the eastern edge of the Dallas Arts District at the end of Flora Street (1722 Routh Street), One Arts Plaza is a downtown destination for luxury urban living, business, dining and entertainment. Â Restaurants include Jorgeâ€™s Tex-Mex CafÃ©, Screen Door, Fedora, The Commissary and Tei-An.